Ill try to upload pics when I get home but here is what im dealing with. built rock rails in place of the rocker panels. I want to do the cut n fold, buut instead of folding whats left of the rusty metal. I want to cut it off and make a plate to go in there. Has anyone done this instead? and if so, how heavy of a steel did you use? the other issue I have is the door hinge pins are worn (again) the bottom hinge is ovaled out, and I have the typical cracks around the vent in the door frame. I want to get the braces that weld in, and figure since im doing one, I might as well do the one to brace the hinges also. Could I drill the ovaled out hole back to round, and size up a bronze bushing to go in the whole and use a bolt or pin to keep the door where it needs to be? I did the cut and fold with separate piece of standard sheet metal (16 Gauge i think) been 4 years in Canada with no issues. As for your door hinges ive never heard of anyone doing this but sounds like it will work with enough time put in. 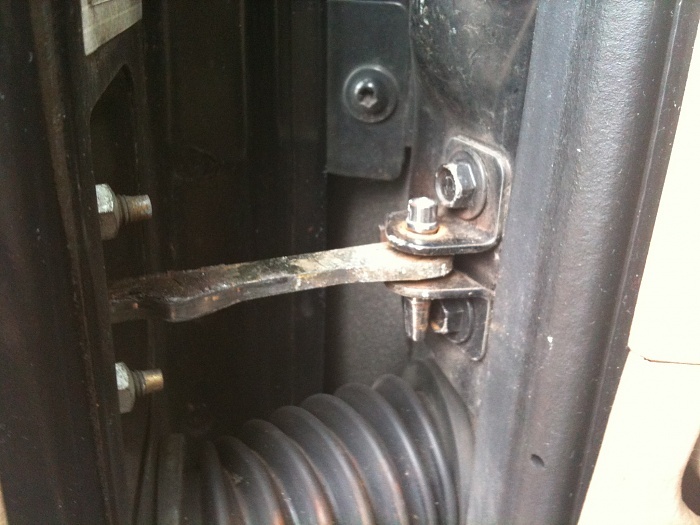 Im guessing you dont want to cut the old hinges off the body and weld new ones on? If I cut the hinges to put new ones in, id prolly do the old style hinges so I could make the door removable. and I got cut and fold panels from the flop shop offroad. not quite related to my original subject, but if I wanted to do some paint repair with the spray touch up paint, whats a good way to go about it? wet sand it then paint it? there are two areas that I need to take to bare metal, so primer, wet sand, paint, then clear coat? Should be; take to metal, fill with bondo if needed (any body damage you should use a base to build it up slightly, glaze coat, primer, base coat, clear coat, wet sand. Wet sand is mainly to clear imperfections in the clear coat. You can do on base coat if you get runs but that would really be about it. To answer your original questions. You probably want a 16-18 gauge steel IIRC. Then spot weld it into place, use body sealant/seam sealer to seal it up. Don't run full welds, no need to and it could possibly warp the metal. Could either do what you're saying or get a bigger bolt and use washer. You can also use this if you want to reinforce it.